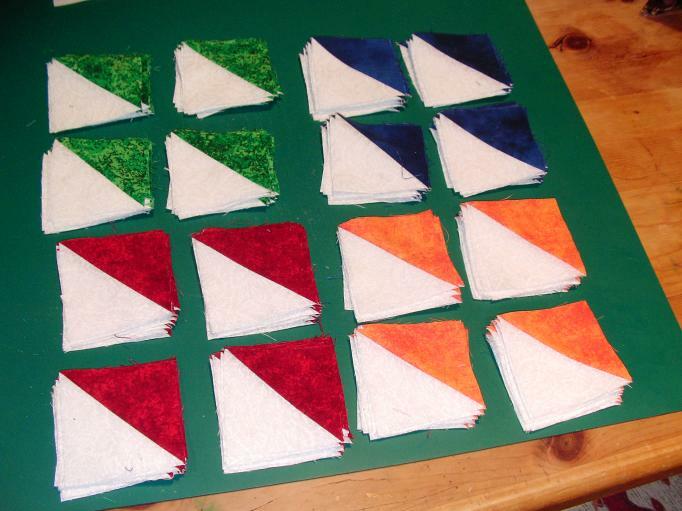 Here are my half-square triangles for Judy’s “Bears in the Farmhouse” Quilt- Along. I used a free pattern template from the World Wide Quilting Page to make my triangles. They have several different size templates available for half-square triangles and quarter-square triangles for both PC and Mac formats. It’s a good idea to print out a sample copy of these patterns first and measure before cutting your fabric. On my computer-and-printer setup, these templates print out slightly smaller than the description, about 1/4 inch, and even that small discrepancy could have ruined my whole quilt. I used a larger template and trimmed the triangles a tiny bit after sewing, and now they are the perfect size.